Taj Mahal is a famous travel attraction in India. This marvelous structure stands in the city of Agra in Uttar Pradesh. Carved entirely out of the white marble, this historical monument symbolizes love and never ceases a chance to impress visitors. Even Indian literature and poems have quoted the beauty of Taj Mahal. Tourists from foreign countries that visit India do not miss visiting Agra to admire this architectural masterpiece. You can visit the place conveniently by contacting a travel management company to book a Taj Mahal tour package on your behalf. There are several affordable Taj Mahal tour packages offered by travel management firms. Most of the packages include the basic arrangements like provision of a private car on a rental basis, provision of meals, and the entire tour of Agra. These packages are sealed with special deals and discounts that can be availed easily by approaching travel management firms. During the tour, all clients get a rich experience and utmost quality meals at reasonable charges. 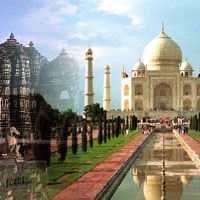 Approach Indiatajmahaltour.com and book one day Taj Mahal trip without splurging.